For the first time, a team of researchers has found a specific place in the human genome that raises a person’s risk of erectile dysfunction. The discovery is a significant advancement in the understanding of the genetics underlying erectile dysfunction and highlights a target for the development of new treatments that could help men who don’t respond to current drugs. Erectile dysfunction, the inability to obtain and maintain an erection sufficient for sexual activity, is a common and costly condition of men of primarily middle and older ages. The disease is linked to many causes, such as neurological, hormonal and vascular factors. Therapies based on these factors exist, but many men don’t respond to them. Genetics are also suspected as a factor in about one-third of erectile dysfunction cases, but researchers have failed to make an association with any specific genomic locations until now. The new study found that variations in a genetic locus near the SIM1 gene are significantly associated with an increased risk of erectile dysfunction. The researchers ruled out that the risk was due to other known risk factors for erectile dysfunction, including body mass index (BMI) or differences in how men describe their erectile dysfunction. The study also demonstrated a biological role for the locus in regulating sexual function, strongly suggesting that these variations can cause erectile dysfunction. The study, “Genetic variation in the SIM1 locus is associated with erectile dysfunction,”will be published online on October 8 in the journal Proceedings of the National Academy of Sciences. The researchers conducted a genome-wide association study in two large and diverse groups to investigate genetic contributors to the risk of erectile dysfunction. The first group included 36,648 men from the Genetic Epidemiology in Adult Health and Aging (GERA), which is part of the Kaiser Permanente Research Program on Genes, Environment and Health (RPGEH). 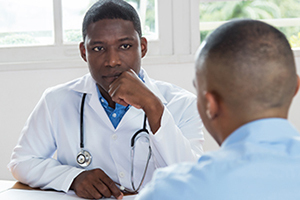 This group included male members of Kaiser Permanente who completed a survey on their condition, had an electronic health record-based clinical diagnosis of erectile dysfunction and had used drugs or other erectile dysfunction treatments. The findings in the GERA group were then verified in a group of 209,758 men from the U.K. Biobank. The study found that variations in the SIM1 locus were associated with a 26 percent increased risk of erectile dysfunction. This risk was independent of known erectile dysfunction risk factors. The association was replicated in the U.K. Biobank sample, providing strong confirmation of the findings. “This significant advance in our understanding of erectile dysfunction is made possible by the unique ability at Kaiser Permanente to link detailed questionnaires, electronic health records and genetic data on such a large population,” said the study’s senior author, Stephen Van Den Eeden, Ph.D., a research scientist at the Division of Research. The study looked to see whether the SIM1 locus was a risk factor when considering differences in how men reported their erectile dysfunction to their doctors. The study found that the SIM1 locus was a risk factor for erectile dysfunction, whether the disorder was defined through clinical diagnoses, prescriptions history or study participant self-report. The study then identified a biological role for the genetic risk locus in erectile dysfunction susceptibility. The SIM1 gene is known to be part of a signaling pathway that plays a central role in body weight regulation and sexual function. The erectile dysfunction locus is located near, but not in, the SIM1 gene. Members of the research team at the University of California, San Francisco, were able to show that the risk locus physically interacts with the promoter of the SIM1 gene, and that variants in this locus alter the function of a master gene regulator, called an enhancer. “The different bits of evidence that we present in this study fit together like puzzle pieces to create a picture of how the SIM1 locus can control erectile function,” Jorgenson said. The study highlights the potential of SIM1 as a target to develop new treatments for erectile dysfunction. Future work will focus on the SIM1 locus in a younger population, because they may be the most likely to have a large genetic contribution to erectile dysfunction. The work received funding from the Robert Wood Johnson Foundation, the Wayne and Gladys Valley Foundation, the Ellison Medical Foundation, Kaiser Permanente Community Benefit Programs, the National Institute on Aging, the National Institute of Mental Health, the National Institute of Health Common Fund, the National Institute of Diabetes and Digestive and Kidney Diseases and the National Eye Institute. Co-authors on the study from the Division of Research include:Jie Yin, Jun Shan and Khanh K. Thai. Co-authors from the University of California, San Francisco, include Navneet Matharu, Thomas J. Hoffmann, Xujia Zhou and Nadav Ahituv. Co-authors from the University of Washington School of Medicine include Melody R. Palmer and Gail Jarvik. This research was conducted at the Kaiser Health Division of Research and University of Washington. The release was adapted from the original article published by Kaiser Health Division of Research.